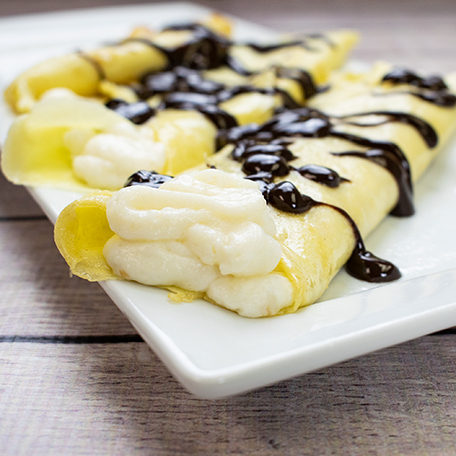 Turn your morning breakfast crepe into a delicious and totally satisfying dessert with creamy custard filling and decadent chocolate sauce. In a saucepan mix milk, sugar, cornstarch and salt over a medium heat. Stir until mixture thickens. Transfer filling to medium bowl, cover and press plastic wrap to top of the mixture. Refrigerate 1-2 hours. Combine flour, sugar and salt then add milk to mixture. Coat pan with butter. Pour about 2 tbs of batter into pan.Lift and move pan around to coat with batter. Cook batter until top looks dry then flip and then transfer onto a plate. Spoon or pipe filling down the center of the crepe and fold over the sides. Drizzle with your favorite chocolate sauce, serve immediately.